When we hear the name 'Snow White', we all remember the renowned animated Disney classic from 1937, with it's colourful characters, charming and fantasised narrative and it's detailed animation. 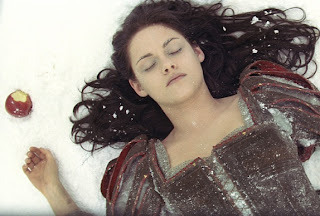 But in an effort to stir things up a bit, this directorial debut of Rupert Sanders takes the classic story and adds a few twists of it's own; combining the fairy tale plot with Lord of the Rings-esque fantasy conventions, this is Snow White as she's never been seen before. Once upon a time in an enchanted land, the beautiful yet corrupt Queen Ravenna (Charlize Theron) murders the respected King Magnus (Noah Huntley) and locks away his daughter Snow White (Kristen Stewart) to take control of his vast kingdom. As the years pass, Ravenna soon learns the imprisoned Snow White is the only person capable of breaking her spell of eternal youth, replacing her as 'the fairest of them all'. After nearly being killed and consequently exiled from the kingdom, the King's daughter befriends a local huntsman (Chris Hemsworth) along with a band of dwarves who, together, lead a rebellion to put a stop to the villainous Queen before she expands her evil across the globe. Unlike the common interpretations of this age old fairy tale, Snow White and the Huntsman focuses on an action packed atmosphere with an exceedingly dark tone. Violence is commonplace and there's no shortage of grim moments, not just to do with the narrative themes but also the mise en scene. This new style breathes a lot of new life into a classic story and provides a more serious experience for moviegoers, but ultimately doesn't do an awful lot to deviate itself from the established conventions of fantasy films; everything from the mythical world to the cinematography feels so ungodly similar to The Lord of the Rings and this prevents what is undoubtedly a well made film from being as original as it could be. Visually the film is rather impressive, with fluid and detailed computer generated effects and good looking environments that capture the mood of the scenes perfectly. Though the scenery is also highly conventional, it still works well to establish the darker tone of the film and bring these vivid locations to life. It's very well shot too; the cinematographic techniques employed throughout maintain a sense of intensity and wonder (though admittedly the handheld camerawork can be a bit too crazy at times), but there are moments where everything in the background seems exceedingly out of focus. I'm unsure if others experienced similar problems, but I found myself unimpressed with the quality of the footage many times throughout. The acting is universally impressive; even our leading lady Kristen Stewart puts a lot of effort into her performance as the titular heroine, though unfortunately she's still pretty bland and at times slips back into her Twilight faults (always the same face) and this isn't assisted when she's given some atrocious lines. 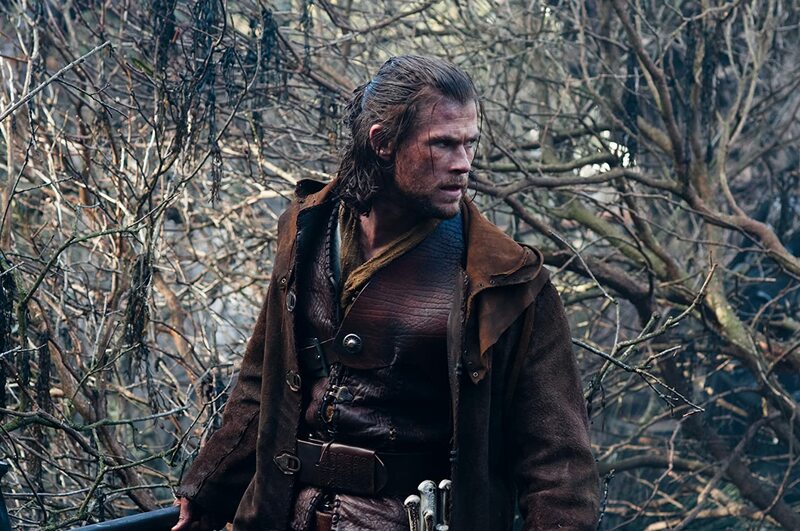 Chris Hemsworth portrays the Huntsman fantastically; the character is easily one of the best in the film with an interesting, funny yet badass persona. Charlize Theron perfectly captures the deranged mind of Queen Ravenna with her highly expressive performance, despite the underused nature of her character. What makes her so impressive above all is how she creates the villain as desperate, insecure and very emotional; she's definitely sadistic and far from good, but she's not a mindless tyrannical killing machine either. The dwarves in the film, portrayed by *insert loads of famous actors here* are funny and charming, but their late entry into the film makes them a bit less interesting. The one major fault I'd love to point out is the ending, which features a completely rushed, generic and anti climactic final battle and a more than rushed return to the new equilibrium at the end of the story. I won't spoil, but I could not finish this review without expressing my disappointment with how the film concluded. 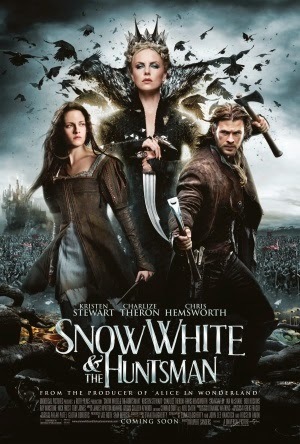 Aside from this and it's other few flaws, Snow White and the Huntsman is an enjoyable fantasy flick; don't be put off by the title if you're not into fairy tales, because this is much more of an action packed fantasy blockbuster. If you're a fan of such films, it's worth a watch, but just don't try and compare it to the genre's greater entries.